The problem with an ordinary external hard disk is that anyone can plug it into a computer and read its contents. And the problem with some systems that encrypt information on disks or flash storage devices is that they usually need Windows-only software to run on the computer you're connecting the drive to before they can be unlocked. The Storage Depot Case - which can accept any standard 2.5-inch SATA hard disk such as those used in the MacBook line - gets round both problems by including hardware-controlled encryption that's unlocked by an RFID tag. The practical upshot of this is that when you plug the drive into a Mac or PC, it doesn't mount until you press one of the two supplied keys to the casing to unlock the drive. The use of RFID - small electronic tags that store small amounts of identifying data - is certainly convenient in this context, though there are concerns about the robustness of the security of RFID systems. 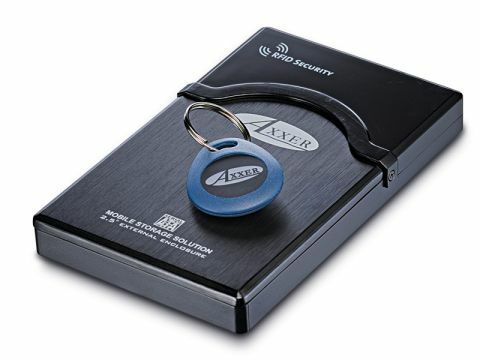 The data on the hard disk is encrypted using the 128-bit AES standard - good enough for the US government for anything up to 'secret' - which means that even if you take the drive out of the case, it won't mount when fitted into another enclosure. Frustratingly, the enclosure seemed to be very picky about which USB cables would bus-power the drive, and though we didn't have any problems with HFS+ when testing, the manual states that only MS-DOS is supported. The case itself couldn't really be described as pretty, but it does seem to do the job. It's not impossible that someone with sufficient resources and motivation could crack the encryption on this drive and, at least in the abstract, the RFID system could be a weak link, but unless you're involved in international espionage, this is unlikely to be a real issue.